Spring forward! I hope everyone is doing okay with losing an hour's sleep! Spring is a time of new birth and growth, and soon Ostara will be upon us, marking the vernal equinox. Today I chose a kind of tough card to explain, as it's a card with both positive and negative connotations. This card is the Hierophant, which is also one of the tougher ones to spell. The name comes from the old Greek term hierophanta, meaning a priest of the Eleusinian mysteries. Wow, that narrows it down. But in a general term, a hierophant is a religious figure- the dictionary goes on to define it as an advocate or expositor, someone who is an authority on a subject and explains that subject to others. A religious figure, in other words, as this card indicates. Let's first consider the role of a religious figure or priest. A priest is the guy who joins the spiritual world to the more mundane world. 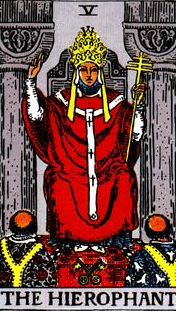 He (or she) connects the community to the spiritual, and therein lies the down side to the Hierophant, that this figure can represent stubborn adherence to tradition. Likewise, the Hierophant represents the accumulated knowledge and experience of a society or group, and its authority. It can be a source of comfort and advice in our lives. Or it can be a force to hold us back, when tradition and dogma bind us to the past, preventing us from moving forwards in our own lives. For better or worse, the Hierophant is that which says "We've always done it this way". Though the Hierophant is almost always portrayed as a religious figure, it represents any tradition- social, spiritual or cultural. The value of these things is the fact that they've evolved over time, and survived. Some things exist beyond their useful life span, and act to hold us to the past, while others can help us make sense of the world around us. Carl Jung, the psychologist, proposed that among our other instincts, mankind has a religious instinct. That is, we have a natural tendency to try to make sense of the things we don't understand. Interestingly, there's a similar figure in the High Priestess, though this card represents individual understanding. The Hierophant represents more revealed truth- not that we don't have to work for it ourselves, which is actually a negative aspect of this card, but rather what's come before. Instead of reinventing the wheel, so to speak, we can act on what's come before. Another negative aspect of the Hierophant is dependence. What does this entail? When we let someone do our thinking for us, and it's also one of the more subtle aspects of this card. Peer pressure can fall into this category as well- instead of thinking for ourselves, we let others do that thinking for us. Not that this is in and of itself a bad thing. You'd go to a surgeon when you need surgery- that way you don't have to learn to operate on yourself. Let someone who has this expertise take care of it for you. But with this, ask questions! Just because we ourselves don't know how to remove a tumor, it doesn't mean we can't ask questions and do some research on our own. Just keep in mind that there are things we don't know. The authorities in our worlds are there for a reason- because though given enough time and effort, we ourselves could learn these things, it's simply easier sometimes to turn to an expert. So to sum up, this is a card of authority and tradition. These things can be powerful influences in our lives, and can help us make sense of the world around us. 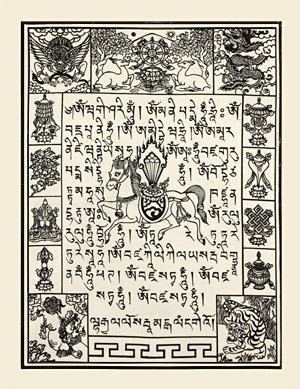 However, tradition and dogma should never be substitutes for experience and our own understanding. Seeing this card in a reading can indicate the need to talk to someone, perhaps an authority figure- someone we recognize as more knowledgeable in that particular area than we are. But at the same time, always think for yourself! It's never a crime to ask questions, nor is it a sin. Advice is always at a premium in this life- good advice, perhaps a little less so. Stay well everyone, and have a wonderful spring!